I recently attended TEDxCMU, my first TED event, and was blown away. I’ve been a big fan of TED for quite some time and have enjoyed numerous TED videos but was really looking forward to experiencing a TED event in person. After some reflection I wanted to share 6 things I learned at TEDxCMU…and it’s not what you think. TED is devoted to Ideas Worth Spreading. It started in 1984 as conference to bring together people from three worlds: Technology, Entertainment, and Design. Since then it’s scope has become much broader and now includes TEDx events, where the x stands for independent events, that take place all over the world and focus on many different topics. The really cool thing is that each talk can only last 18 minutes which I found really forces the speaker to hone their message and delivery – resulting in some fantastic presentations. The theme of TEDxCMU was IMPOSSIBLE and we were treated to TED videos from other TED events, live talks covering medicine, music, design, branding, getting what you want in life, and so much more. While I found the talks wonderfully engaging, entertaining, and enlightening, I was more struck by the energy of the audience, the conversations I had, and the people I met. You actually miss so much by not being their in person so do yourself a favor and attend a TED event in person. During the TEDxCMU event we heard a live performance from Paul Dateh and Ken Belcher. I was blown away by the experience. I’ve attended many concerts and live performances in my life but it has been a long time. While I enjoyed the piece that Paul and Ken played for us I was most interested in the passion, professionalism, and experience of hearing them play. I was reminded about the ability of music to tell a story and Paul and Ken were great story tellers. I encourage you to attend a live musical performance, especially music with which you are unfamiliar, and attempt to “hear” the story. When you do “hear” it, you’ll never forget it. My expectations going to TED were that I would hear, learn, and be exposed to different ideas and fields of study that were new to me. While that was certainly true, I realized that I began to focus more on the presentation styles and delivery of the speakers. I became interested in their use of media to help tell their story, or in one case, their lack of media. I began to pay attention to when they paused during their delivery for dramatic effect and when the speed up to force anticipation. I focused on their movement and lack of movement during certain parts of the presentations. I realize this focus might be my bias but the lesson for me is that there are many things to learn from attending live events so keep the possibilities open when you are next in an audience. You might be surprised at what you really end up learning. It’s been quite some time since I was last on a University campus for something other than a sporting event. TEDxCMU was, of course, hosted at Carnegie Mellon University and even though it was early on a Sunday morning I was invigorated by the vibe and energy I felt. During the breaks at TEDxCMU I enjoyed hearing people discussing ideas solely for the simple purpose of debating the idea and not for some ulterior purpose like getting a better grade. I felt recharged after spending the day at TEDxCMU and while most of my energy came from the TED event itself, a good portion of that energy was a result of being at CMU. A theme from a number of speakers was that a college degree has become a commodity and I had a great discussion at lunch with a CMU professor centered on the idea of college students focusing more on ideas and not grades. “Life Long Learner” is cliche and over-used, in my opinion, but the idea that we never stop learning was reinforced in a big way at TEDxCMU. Never lose your ability to question or to seek answers to questions – I feel like my life is richer for the experience at TED and I’m excited to extend the discussion of the ideas from TED to see where those discussions will take me next. As a proponent of social networking I was reminded about the real purpose of social networking…to network. I’ve talked numerous times on this blog about the connections I’ve made through social networking but by attending TEDxCMU I met a CMU professor, the owner of a cool startup called BrainCredits, a graduate student working on a website called Hackety-Hack, and had a cool discussion about social entrepreneurship with the women sitting in front of me. I was reminded to take the time to get out once and a while and meet people in person – I hope you meet the great range of people I met. 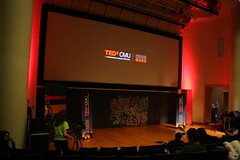 As I hope you can tell, I loved my experience at TEDxCMU and can’t wait for next year’s event. The “magic,” and I use that word purposely, happening there is just cool and I hope by following some of my advice you can experience a little magic of your own. If you’ve attended a TED event yourself I would love to hear about your experiences by posting in the comments section below. What great timing! I’m so excited that you decided to attend and look forward to hearing your experiences – make sure to let me know and have a “magical” time! Interesting timing on your blog. I received a email saying that Traverse City will be hosting an TEDx in May the same day. I signed up right away based on your blog. I look forward to this event.